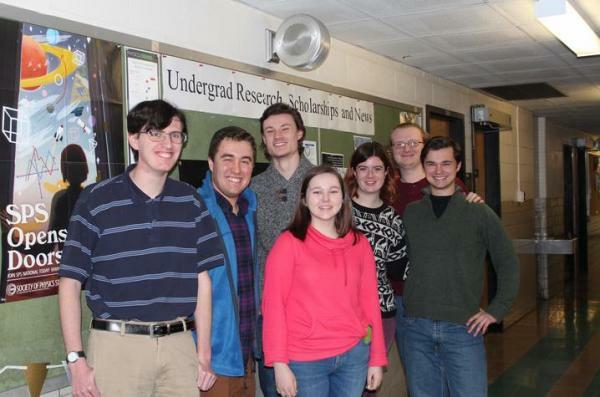 (L to r) SPS students Kris Andrew, Joseph Feliciano, Alston Croley, Lillie Cole, Dany Waller, Tom Shelton and Alex Blose. 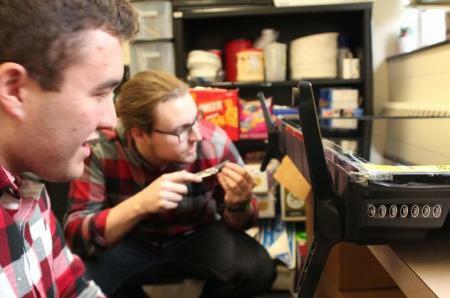 The University of Kentucky Society of Physics Students (SPS) chapter has won an Outstanding Chapter Award and a Chapter Research Award from the SPS National Office. The Chapter Research Award is a competitive financial grant for a yearlong research project. With the Outstanding Chapter Award, SPS chapters are recognized for high levels of interaction with the campus community, the professional physics community, the public and with SPS national programs. The outstanding chapter designation is given to less than 10 percent of all SPS chapters in the United States and internationally. Although this is the second time the UK chapter has received this award, it has been almost 25 years since UK was initially recognized as a top-tier student-led physical sciences organization. For the Chapter Research Award, chapters submit research proposals with the top five percent receiving the financial grant. The title of their proposal is "Data Analysis and Accuracy: Small Supercomputer versus a Desktop Dinosaur." Students will build a mini-supercomputer following the Tiny Titan building plan from Oak Ridge National Lab. Once built, it will be used for research projects, experiments and simulations. Additionally, students will present the supercomputer during the SPS Open Lab Day this spring. The chapter's president, Dany Walker, said, "This recognition is a high honor for the University of Kentucky and for science achievement at the higher education level in Kentucky. We are so thrilled to be recognized and look forward to doing even more work in our community." The UK Society of Physics Students chapter is a professional and social organization for physics majors and minors, as well as students with a general interest in physics. SPS operates within the American Institute of Physics (AIP), an umbrella organization for professional physical science societies. Each semester the chapter hosts interactive presentations during which professors speak about their research and provide students with the opportunity to interact outside of a traditional classroom setting. Additionally, SPS also hosts an open lab day to promote education in physics and showcase the research occurring in the Department of Physics and Astronomy, which is part of the UK College of Arts and Sciences. 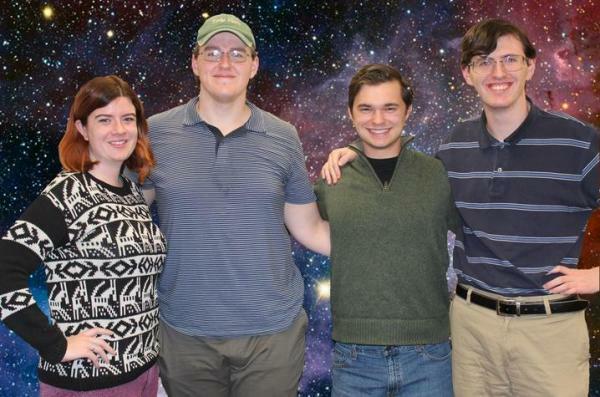 (L to r) Dany Waller (SPS president), Henry Colburn (SPS vice president), Alex Blose (SPS secretary) and Kris Andrew (SPS treasurer).